This recipe is so quick and easy, it can be made in about half an hour. We use it in place of bread for sandwiches or just eaten plain. We are hooked on it! If you would like the bread to be flatter, you can leave out the baking powder. Optional: If you are using garlic, finely mince garlic and saute briefly in medium hot skillet with some olive oil. Meanwhile in a mixing bowl, combine flour, baking powder and salt. If you have sauteed garlic or onions to add to the bread, this is a good time to add them. Add yogurt. Add olive oil as needed for a nice soft, easy to use dough. Heat cast iron griddle or skillet to medium high heat (5 on my gas stove). Divide dough into 6 portions. Roll each portion into a ball, then roll out flat into a circle, 1/8" thick or less. Brush a little olive oil onto skillet or griddle and add a flatbread. Cook 1 minute on each side, then remove to a dinner plate and keep covered with clean dish towel to keep warm as you finish with the remaining flatbreads. While it is cooking, you can be rolling out the next flatbread and cook as described above until all are cooked. This would also be good with seeds added to the dough, such as caraway, fennel, sesame, finely chopped sun dried tomatoes, and/or with garlic or onion, minced and sauteed, then added to the flour mixture. 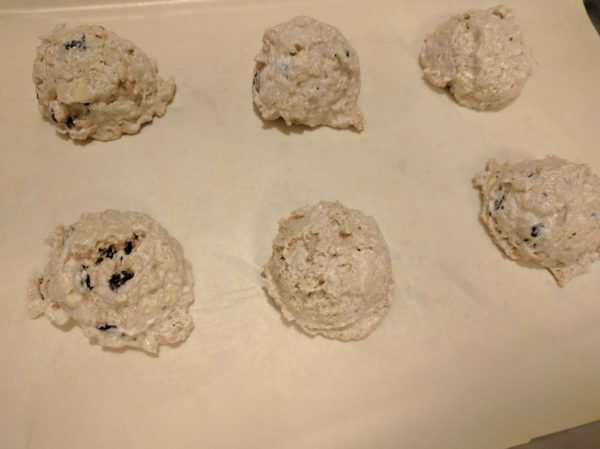 The seeds can be added to the dough, or sprinkled on top of the dough as you are rolling it out into rounds, then use the rolling pin to press them into the dough as you are shaping it. Although spelt is an ancient form of wheat, it is safe for most people with wheat allergies. It does, however, contain gluten. If you know you have a wheat allergy or wheat intolerance, eat at your own discretion. 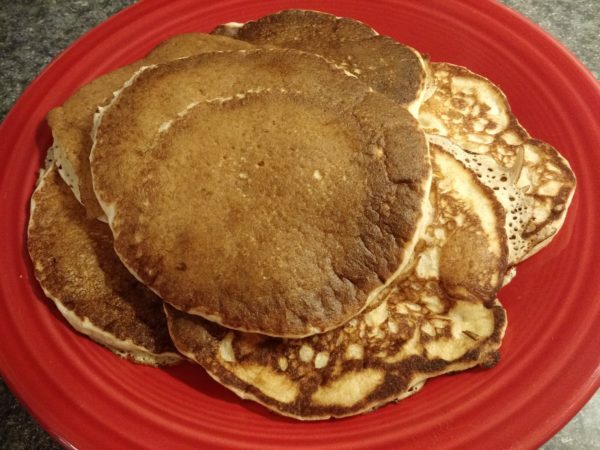 This recipe came from www.thebusybaker.ca/2015/04/healthy-buttermilk-pancakes.html. The idea is that the butter and sugar is replaced with mashed banana, which makes it healthier. They were pretty good, light and fluffy, had a bit of a banana taste, but not too much. I cut the recipe down because it made a huge batch! Whisk together flour, baking powder, baking soda and salt in a medium sized bowl. Set aside. Mash banana. Add egg and vanilla and beat until smooth. I just used a fork. Add banana mixture and buttermilk to flour mixture. Stir everything just until combined. Heat well seasoned cast iron (or your choice) griddle over medium heat. Add a little butter or oil if necessary. Ladle about 1/2 cup batter at a time onto griddle. When you see some of the bubbles around the edge begin to break, flip the pancakes over. Cook on the other side just until a nice golden brown. Serve immediately! 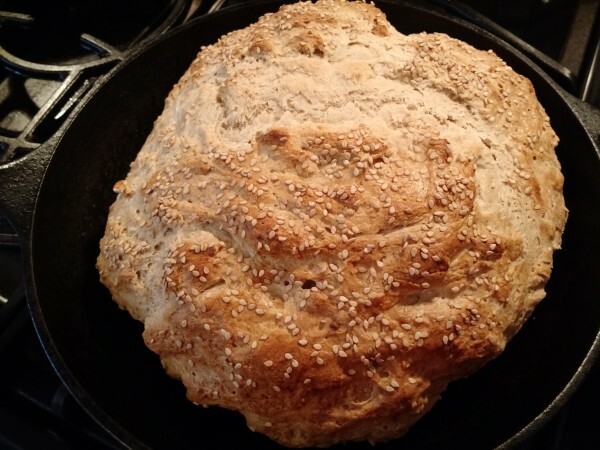 This is much faster and easier than making bread from yeast, but is very delicious! Total time for preparation and baking is about 35 minutes if you are using buttermilk. This is a moist, tender bread rather than the crusty bread that I usually make. This is wonderful for sandwiches, but also makes good toast. 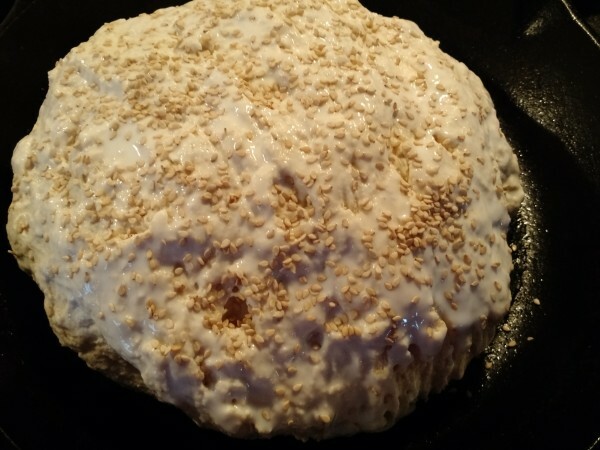 If you desire sesame seeds, poppy seeds, or caraway seeds on the bread, that is an option. 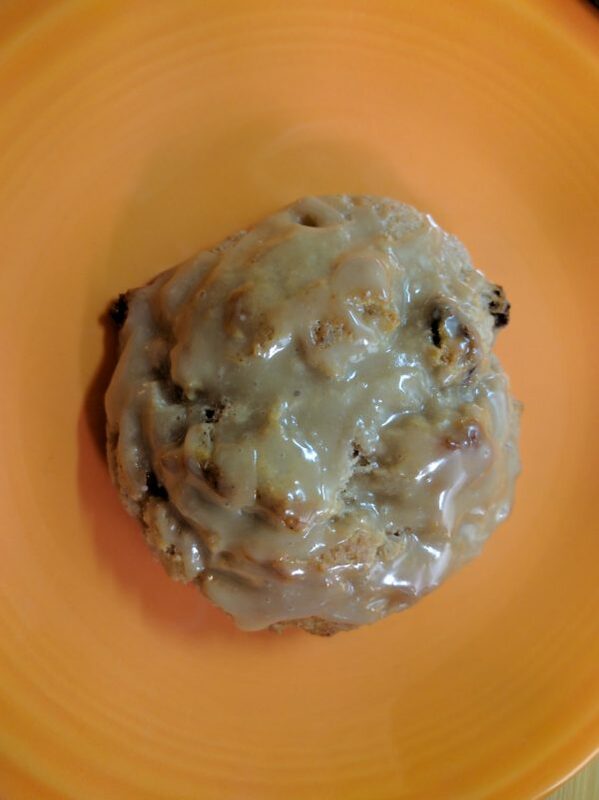 If you want to add 1 cup of raisins or cranberries, you can do that too! This is very versatile! I like to brush the top of my loaf with one of these choices: egg wash (makes a crustier bread), butter or milk. These will help make the crust a pretty brown. However, it is totally up to you whether you do this or not! Preheat the oven to 400 degrees. If you are not using buttermilk: In a cup or small bowl, stir together the milk and vinegar. Let stand for 10 minutes, or until curdled. In a medium bowl, stir together the flour, salt, baking soda, baking powder. Stir in the buttermilk and honey until smooth. Scrape the dough out of the bowl onto a floured surface, and shape into a disc. Place the disc into a cast iron skillet. (Mine is 9 1/2" and was plenty big enough for a batch and a half.) Lightly cut a cross in the top of the loaf. Brush top of loaf with egg wash, milk, or butter (opt.) Now would be the time to add sesame seeds, poppy seeds, caraway seeds, etc. Bake for 25 minutes in the preheated oven, or until the crust feels firm to the touch. The first instruction image was my first attempt at this bread. It tasted great, but was pretty ugly because I did not brush the crust with any milk, butter or egg. The other images were my second attempt. I made a batch and a half and baked it for 30 minutes. I forgot to cut the cross in the top of the loaf, but brushed it with butter before baking and shaped it better with my hands. It is a much prettier loaf. I made a double batch, used the same medium sized cast iron skillet and baked it for 35 minutes. It was perfectly done! 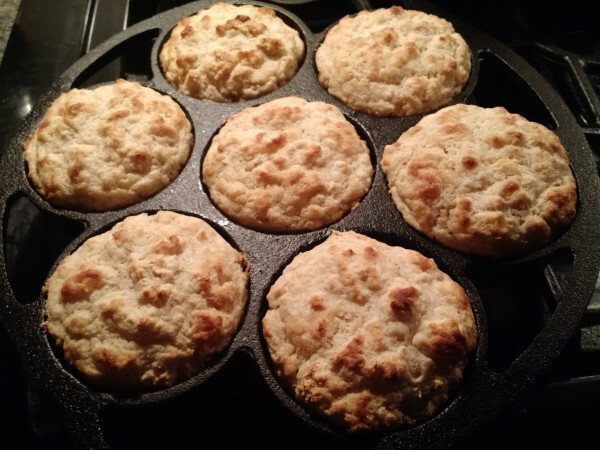 A very easy biscuit recipe baked in Lodge cast iron biscuit pan. 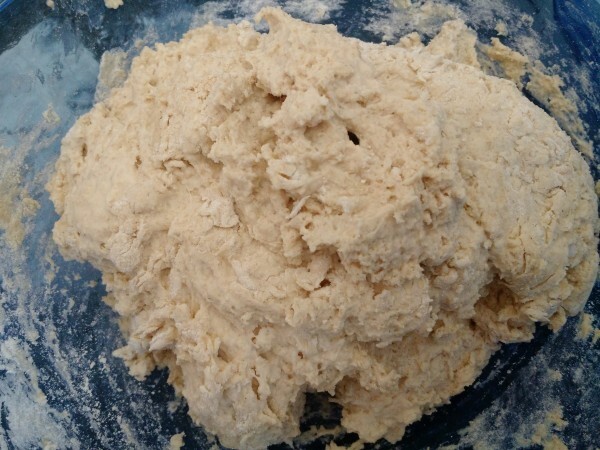 The flour mixture can be made up ahead of time, cut the butter in, then refrigerate or freeze until needed. Then just add the buttermilk, drop biscuits into pan with an ice cream scoop and bake. 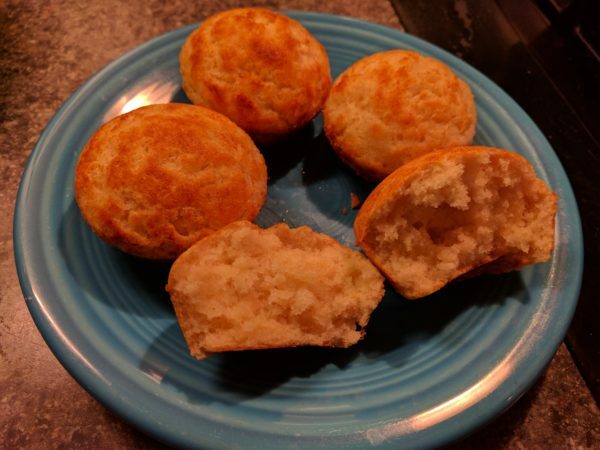 This recipe works great in a mini muffin maker. This size works better for us since it is usually just the 2 of us, so we don’t really need 7 enormous biscuits between us. 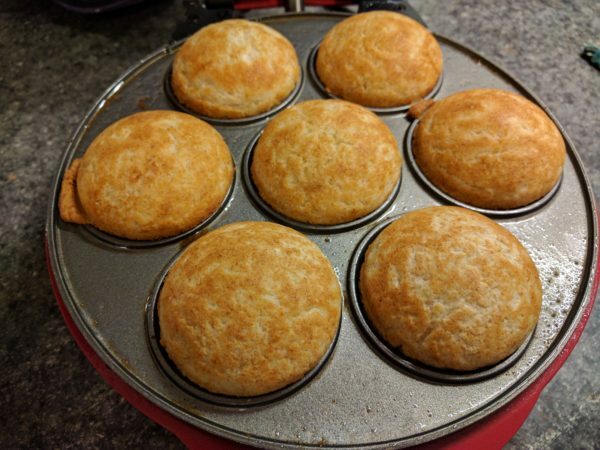 It also worked out great for Christmas morning when the oven temperature for the biscuits was 100 degrees warmer than the oven temperature for our egg casseroles. We really like how the edges come out kind of crunchy. In a bowl, stir dry ingredients together. Cut in butter to coarse crumb stage. This can be covered and stored in the refrigerator or freezer at this point. Add buttermilk. Stir just until blended. 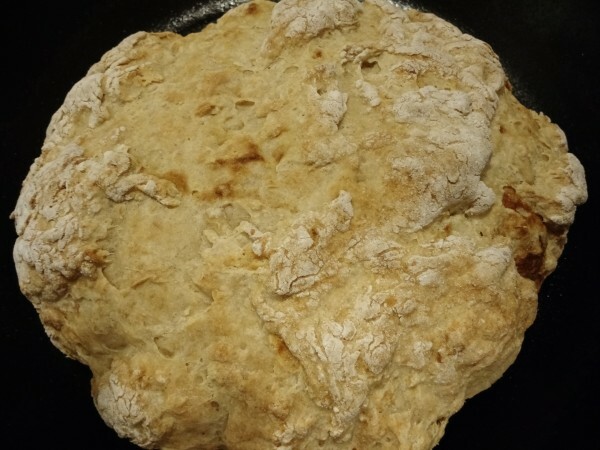 Drop dough into Lodge biscuit pan, using 3 oz. scoop. Bake 15-18 minutes in 450 degree F oven. Serve warm. This works great in a mini muffin maker. Use 164 g. of mix and 100 g. (7 T.) buttermilk. Use 1 oz. scoop and cook for 6-7 minutes.